← Being a basically immature individual. After finishing my Mass Effect trilogy replay – I’ll have a post about that in a few days – I was looking through my backlog for inspiration and realized that I had a bunch of games on the PS3 that had been picked up in one PSN sale or another and never played. I figured I’d dig the system out, hook it up, and see whether or not I actually wanted to give any of them any serious time. The answer was no, by the way, which was kind of a depressing realization. I doubt I spent more than five dollars on any of the games I wound up consigning to the digital trash heap, but it was still a reminder that I used to be pretty indiscriminate in what I bought, so long as it was a bargain. Anyway, after feeling a bit silly about the money I’d wasted, I decided to work off some of the frustration with a quick Dark Souls session. I’d never actually played the PS3 version of DS1, but I picked up a disc of it in Japan last year because I liked the cover art and I thought it might be interesting to see what the game was like under the limitations of its original hardware. I have a habit of starting up Dark Souls, creating a new character, making a mad dash through the graveyard to grab the Zweihander, grinding up enough levels so I can two-hand it, and then going and killing the Taurus Demon and the Gargoyles so I can ring the first bell of awakening. It takes me a bit over an hour to do this. I’m not exactly a speedrunner. 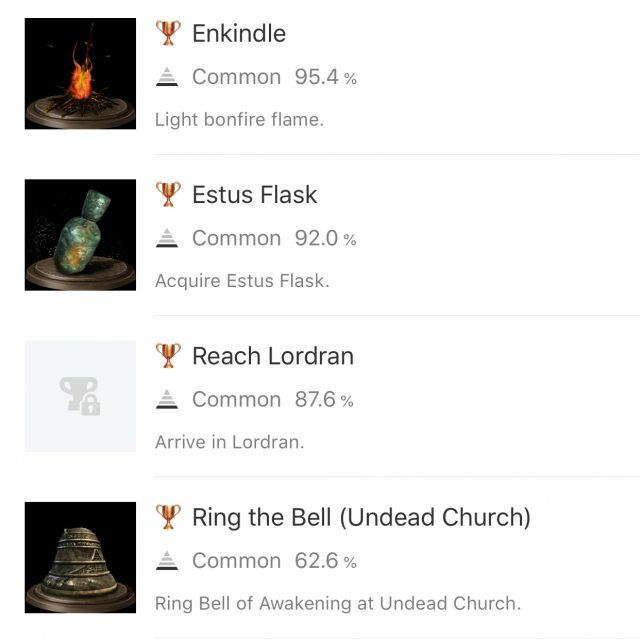 The strangest thing happened when I got to the bonfire above Andre, however – I had the “Estus Flask” trophy pop. This is normally a trophy you get about five minutes into the tutorial. On the other hand, I was playing a Japanese version of the game. Maybe the trophies were laid out differently? I kept going, whacked the Gargoyles, got the general feeling of self-satisfaction that always comes after killing a Souls boss even if you’ve killed it a dozen times before, rode the elevator back to Firelink and shut the game down. …I’m not really sure how that happened, but I’m kind of tickled to see it. Side note, when it comes to games you wouldn’t expect to still have any multiplayer action happening, the original Dark Souls ought to be right at the top of the list. It’s seven years old at this point, and there are superior versions on every modern console and PC. I did NOT expect to get to Solaire’s ledge before the gargoyles and see FOUR white soapstone signs next to his bright yellow summon sign. This entry was posted in ps3, Souls. Bookmark the permalink.